▷ Best Highlights vs Lowlights 2019 ¡Photo ideas & step by step! So you are looking to have a change of look on your hair, but you do not know what to do. Especially when talking about all those technical names stylists use for everything, highlights, lowlights, babylights, ombré, balayage… It sometimes even feels like they are trying to drive us crazy. Add to the fact that the names don’t usually tell us what they are supposed to look like, and what it all does it leaves us even more confused, but fear no more, we are here to help you understand the basics. Let us begin with the basic techniques, highlights and lowlights. Both of this techniques are a partial or placed coloring in with just a few sections or strands of hair are dyes, their first intent is to add some beautiful depth, movement and dimension to your hair. They look best when they are done together in your hair as they will blend perfectly together to create a superb sun kissed look. Highlights and lowlights can be both done separately and at the same time, any way you decide to apply them they will look beautiful no matter what. A huge misconception people seem to have is that both highlights and lowlights are just like streaks, and that is not further away from the truth. 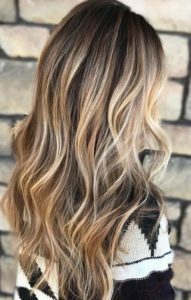 Highlights are strands of sections of your hair that are dyed, usually a few shades lighter than your base color, their main purpose of adding highlights to your hair is to add lights and to overall brighten your hair color as well as adding softness and dimension to it. The shade that you should use for your highlights is determined based mostly on your natural or base color and your complexion. It does not matter what the base color is, it is recommended that you do not go more than 3 shades lighter, for example, if you have jet black hair your highlights should be a shade of dark brown, brunettes should go for copper or caramel hues and blondes should definitely go for a lighter blonde shade. 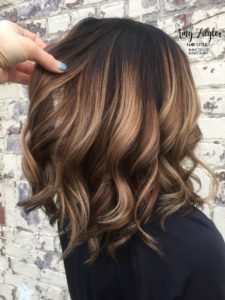 You have two ways to apply the highlights to your hair, you can go for a hand painted technique (which known more popularly like ‘balayage’), with this technique the hair dye is painted freehanded onto the hair to have a perfect blend between the base and the highlights shade. Or you can go with the more traditional foil highlights route. 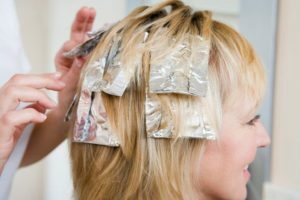 With this method aluminum foil is used to separate the sections of hair that are being highlighted preventing the color from getting on the surrounding hair and precisely give you the look that you have been looking for. 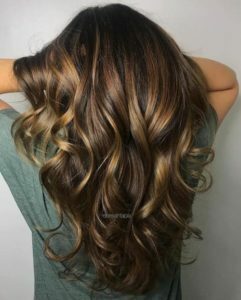 When highlights are strands of hair that are dyed a lighter shade than your base color then lowlights go the complete opposite direction, they are based on picking up a few thin or even thick sections of hair and coloring them in a color that is 2 or 3 shades darker than your base color. Lowlights have the intention of adding dimension and depth to your hair look, they can also work wonder at the moment of making your hair look thicker and more voluminous in general. When people go for lowlights they usually have had highlights before a few times and want to add some color to the back of their overly lightened strands. This technique can be dyed into your hair using the same coloring technique used in highlights like balayage or even tinfoil techniques. The overall goal for the lowlights it to add depth and create volume, or the illusion of it, at the same time as correcting old highlights if needed. This technique can be applied among with highlights or by itself. But, what are the differences between highlights and lowlights? 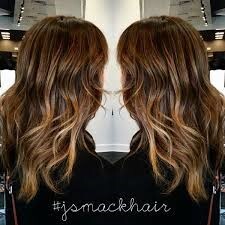 There is really no rule dictating this per se, but highlights usually look better on dark hair –like when you add highlights on shades of brown and black) and lowlights have a better, or more prominent, effect on lighter shade, they will look amazing when added to light brown or blonde hair. While with lowlights the damage to your hairs stays in a minimum as the only damage it will get is from the hair dye needed to add the needed darkness, with highlights instead your hair will have to endure more damage as it primarily involves bleaching your hair to lighten it. 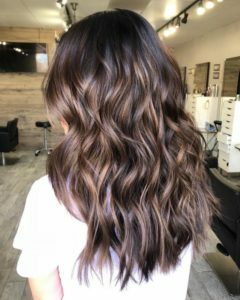 Highlights and lowlights are what you need to ask to your hair stylist if what you are looking for is multiple honeyed shades running through your locks like Jennifer Lopez, or if you want five shades of chocolate color like Kristen Stewart. As they are essential a partial coloring of the hair, adding different shades to certain strands of hair. And If you are looking for a subtle change to just enhance your beauty these are the perfect techniques for you and your hair. You can easily ask to your hair stylist for a full head of a half head, this means you can choose between having just the bottom part of your hair dyes or just the top part, although the latter one is not a good option if you wear your hair up a lot as it will not look great. You can also have a T-section, or infills, done to maintain the look as your roots start growing and showing. What we mean by this is that only a small section of the roots on the top your hair is re-dyed, this will make the maintenance of your look cheaper. Plus, you don’t really have to stick with only highlights, there are plenty of variations to play with! There the ‘Dip dye’ hair color, which involves lowlights on the roots and highlights on the ends. 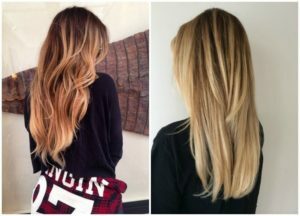 With blonde highlights and lowlights it is believed that it has to be simple to find the right shade and color but the truth is that it isn’t, blonde having such a wide arrange of shades and colors it can actually turn out pretty hard. You have to also take into consideration the base color of your hair as well as your complexion undertone, for example, if you have a warm complexion then going for warmer highlights/lowlights will be your answer, but if you have cooler complexion then cooler tones will make you look better. For highlights, all you have to do is apply bleach for a short amount of time, 20 minutes’ top, and you will have the highlights that will not only brighten your hair but also your face! Then all you have to do is add a toner to make everything look seamless and you are done! Now, for lowlights the best shades for you to work with vary from medium-light brown to dirty blonde hair depending on how light your natural color is. The most important thing here is to trust your hairstylist so you can end with the better results. 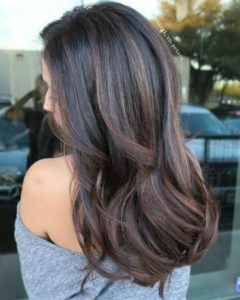 With brown hair happens the same as with the blonde highlights, is has such a wide variety that choosing the right tone for your base color some people may say its next to almost impossible. But do not be afraid, that is why you are trusting your hair stylist, so you can sit back and relax until you have your amazing results! 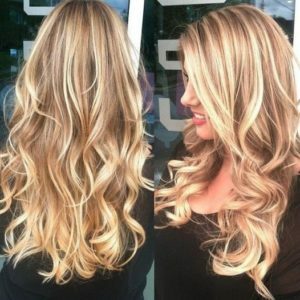 Highlights can give you a sun kissed look, that will make it seem like you are one of those girls that spend all summer at the beach having fun and relaxing, the best shades for you to try and highlights are actually some blonde highlights, they match with any hair color and can do wonders to your hair. If you are looking for a subtler look about your hair, then some golden highlights can do wonders to it. Just add them to the parts of your hair that would naturally lighten and voilà, you will have a wonderful and natural look. And for a little more risqué look, adding a tint of color to your highlights can give you a unique look as well as making you look younger. 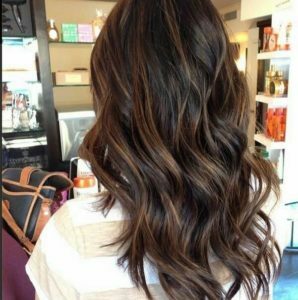 For lowlights, if you have light brown hair then chocolate lowlights can work wonders in adding dimension and movement to your hair. And for darker hair then adding a slight hint of black can make it look like a completely different hair without having to dye your whole mane. Picking a highlights color for red hair is quite like the blonde haired girls out there, picking put a color that’s 2 or 3 shades lighter should do the trick. But if you are not really sure what shade is that then up here we will leave you some ideas for you to choose. 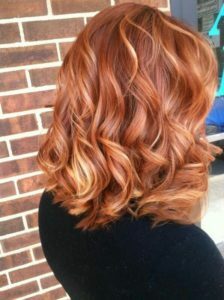 First, we recommend for you to always go for gold and warmer colors as red hair tends to go to this side of the spectrum. This will add warmth and dimension to your hair without any further ado. You can try highlighting your red hair with golden hues, this will not only add light but also a different touch to your hair so it is beautiful both inside as outside under the direct sun light. 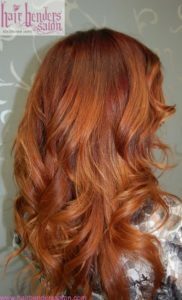 For lowlights it is quite difficult to find some, the best thing for you to do Is to add a deeper red shade so you can have the best results. A mahogany shade can add a very deep and bold lowlights, for example. Hair gets an immense boost from highlights and lowlights, their benefits range from heightened depth and texture to a more visible movement and this creates the overall illusion of fullness. 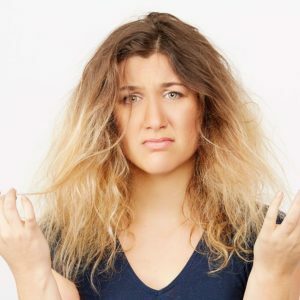 Fear of damaging their hair stops most of the persons that even think about dyeing, and while it is true that you cannot avoid damage, it does not mean that you should not try at least try it. All you have to do is proceed with caution at the moment of lightening your hair, we recommend you to trust your amazing hair on the hands of a hair specialist they are the ones who know better what can help your hair and what can’t. Assuming that you do not really want a complete change of look but after all you still want it, highlights, or even lowlights, are just perfect for you they will add a touch of color that will give your hair more depth and movement. Now that you already have your highlights, or lowlights, we need to take care of them, the easiest way to keep your hair healthy after the rough treatment of the hair dye is to keep it hydrated with conditioner and even adding oils to your scalp at least half an hour before washing your hair. It is also a good idea to lower the days in which you wash your hair as shampoos can also dry your hair when you over use it and you don’t let your hair’s natural oils to come out keeping your hair the healthiest it can be.